OK, I shouldn’t be surprised. Yet I am. Biking out through Dedham, Wellesley, Newton and back into Boston neighborhoods, I did not see a single one of the hundred or so cyclists who did not have a pricey jersey. I felt like such an old hippie and I guess I am. I buy my tires, tubes, tools and gear from the biking monster Nashbar/Performance/Bikes Direct. I know those designer jerseys are $100 to $150 per, replete with the logo of the beer or such you are pandering to advertise. I own a few of those, because they were two-thirds or three-quarters off. My favorite in the drawer is Mickey Mouse; it is garish and gives me an advantage cycling with inattentive drivers. 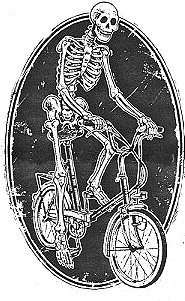 Today though, I rolled out in an orange tee-shirt with a skeleton on a cycle. It was a memento from a Tour de Graves in Boston when Ray Flynn way mayor and before he became a drunken conservative ambassador to the Vatican. I was an old guy with a T instead of a stylish fashion statement. I know in my heart of hearts and on the occasional radar machines on the roadside that I can skunk the 20, 30, 40 and 50 somethings in their high-end jerseys and multi-thousand-dollar bikes. Instead, I find myself glad to see so many cyclists out of Labor Day weekend. In Wellesley in particular, many dozens of deuces and quartets plied their Spandex-contracted flab on public byways. Bless their hearts. Worthy and workman-like they are. I can’t begrudge them their need for attention. Let us allow they are exceptional, privileged folk who might otherwise stress a lawn chair and instead are trying to be simultaneously fit and pretty. Sorry, hipsters and fogies, though. The really scrawny and big-bellied in their high-end jerseys are laughable. If you’d been a jock in your teens and gotten the hormones coursing, you wouldn’t be a flab bowl or a skinny-jeans joke now. Let’s all ride every weekend…hell, every day. In Seattle, I am always presumed to be a college student. I suspect it is a combination of my youthful-looking face and the fact that my bike attire often is not cycling attire at all, just clothes and a cheap bicycle. Conspicuous consumption is alive and well with bicycling!